Farrar, Straus and Giroux, 9780374531386, 256pp. 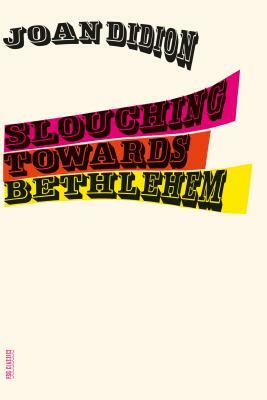 The first nonfiction work by one of the most distinctive prose stylists of our era, Joan Didion's Slouching Towards Bethlehem remains, decades after its first publication, the essential portrait of America—particularly California—in the sixties. It focuses on such subjects as John Wayne and Howard Hughes, growing up a girl in California, ruminating on the nature of good and evil in a Death Valley motel room, and, especially, the essence of San Francisco's Haight-Ashbury, the heart of the counterculture.